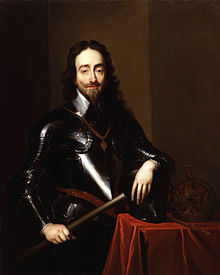 The Caroline or Carolean era refers to the era in English and Scottish history during the Stuart period (1603–1714) that coincided with the reign of Charles I (1625–1642), Carolus being Latin for Charles. The Caroline era followed the Jacobean era, the reign of Charles's father James I & VI (1603–1625); it was followed by the Wars of the three Kingdoms (1642–1651) and the English Interregnum (1651–1660). The Caroline era was dominated by the growing religious, political, and social conflict between the King and his supporters, termed the Royalist party, and the Puritan opposition that evolved in response to particular aspects of Charles's rule. Aside from the bloody conflict of the Thirty Years' War then raging in continental Europe, the Caroline period in Britain was one of an uneasy peace, growing darker as the civil conflict between King and Puritans worsened toward the latter part of Charles's reign. In literature, and especially in drama, the Caroline period has often been regarded as a diminished continuation of the trends of the previous two reigns. Caroline theatre unquestionably saw a falling-off after the peak achievements of William Shakespeare and Ben Jonson, though some of their successors, especially Philip Massinger, James Shirley, and John Ford, carried on to create interesting, even compelling theatre. In recent years the comedies of Richard Brome have gained in critical appreciation. In poetry, however, the Caroline period saw the flourishing of the Cavalier poets (including Thomas Carew, Richard Lovelace, and Sir John Suckling) and the Metaphysical poets (George Herbert, Henry Vaughan, Katherine Philips and others), movements that produced powerful figures like John Donne, as well as lyrically satisfying artists like Robert Herrick. If the Elizabethan era was the golden age of English drama, the Caroline age was nearly as rich in the realm of non-dramatic poetry, bringing as it did the beginnings of the career of John Milton, in addition to the poets of the movements already mentioned. In the visual arts, the portraiture of Anthony van Dyck (appointed "painter to the king," 1633–1641) was a dominant influence, and has sometimes been credited with founding an English school of painting. Upon his death in 1641, his position as portraitist to the royal family was filled, practically if not formally, by William Dobson (ca. 1610–1646), making Dobson the most prominent native-born English artist of the era. Inigo Jones carried forward his work in architecture and design, though without breaking new ground. The peculiar artistic form of the court masque was still being written and performed, including the final masques of Ben Jonson (printed 1625–34). The lavish expenditures on these showpieces—the production of a single masque could approach £15,000 —was one of a growing number of grievances that critics in general, and the Puritans in particular, held against the King and his court. The sciences saw a major step forward with the 1628 publication by William Harvey of his study of the circulatory system, Exercitatio Anatomica de Motu Cordis et Sanguinis in Animalibus ("Anatomical Essay on the Motion of the Heart and Blood in Animals").The reception granted to Harvey's work was, unfortunately, highly critical and hostile; but within a generation his work began to receive the valuation it deserved. More broadly, the revolution in thinking that connects Sir Francis Bacon (1561–1626) with the foundation of the Royal Society (1660) was ongoing throughout the Caroline period; Bacon's The New Atlantis was first printed in 1627, and contributed to the evolving new paradigm among receptive individuals. The men who would begin the Royal Society were for the most part still schoolboys and students in this period—though John Wilkins was already publishing early works of Copernican astronomy and science advocacy, The Discovery of a World in the Moon (1638) and A Discourse Concerning a New Planet (1640). Lacking formal scientific institutions and organizations, Caroline scientists, proto-scientists, and "natural philosophers" had to cluster in informal groups, often under the social and financial patronage of a sympathetic aristocrat. This again was an old phenomenon: a precedent in the prior reigns of Elizabeth and James can be identified in the circle that revolved around the "Wizard Earl" of Northumberland. Caroline scientists often clustered similarly. These ad hoc associations helped individuals to avoid the dark by-ways of alchemy and astrology, Neoplatonism and Kabbalah and sympathetic magic—temptations that trapped more than a few in this era (like Sir Kenelm Digby with the Powder of Sympathy). sign for multiplication. In philosophy, Thomas Hobbes (1588–1679) was already writing some of his works and evolving his key concepts, though they would not see print till after the end of the Caroline era. And on the dark and obscure flipside of science, the occultist Robert Fludd continued his series of enormous and convoluted volumes of esoteric lore, begun during the previous reign. In 1626 appeared his Philosophia Sacra (which constituted Portion IV of Section I of Tractate II of Volume II of Fludd's History of the Macrocosm and Microcosm), which was followed in 1629 and 1631 by the two-part medical text Medicina Catholica. Fludd's last major work (there were various minor ones in between) would be the posthumously-published Philosophia Moysaica (1638). However one chooses to evaluate Fludd's intellectual achievement, the superb and daedally complex illustrations in his books, masterpieces of the engraver's art, are a cultural enrichment. ^ Hirsch, Edward (2014). "A Poet's Glossary". Houghton Mifflin Harcourt. p. 93. Retrieved 16 September 2016. ^ Cambridge History of English and American Literature, Vol. VII. ^ Ellis Waterhouse, Painting in Britain 1530 to 1790, fourth edition, New York, Viking Penguin, 1978; pp. 80–5. ^ William Cavendish, 1st Duke of Newcastle, spent between £14,000 and £15,000 on staging Jonson's last masque, Love's Welcome at Bolsover, for the King and Queen on 30 July 1634. Henry Ten Eyck Perry, The First Duchess of Newcastle and Her Husband as Figures in Literary History, Boston, Ginn and Co., 1918; p. 18. ^ Carl B. Boyer, A History of Mathematics, second edition, revised by Uta C. Merzbach; New York, John Wiley, 1991; pp. 306–7. Coward, Barry, and Peter Gaunt. The Stuart Age: England, 1603–1714 (5th ed 2017) new introduction; a wide-ranging standard scholarly survey. Cressy, David. Charles I and the People of England (Oxford UP, 2015). Davies, Godfrey. The Early Stuarts, 1603–1660 (Oxford History of England) (2nd ed. 1959), a wide-ranging standard scholarly survey. Lockyer, Roger. The Early Stuarts: A Political History of England, 1603-1642 (Addison-Wesley Longman, 1999). Morrill, John, ed. The Oxford illustrated history of Tudor & Stuart Britain (1996) online, a wide-ranging standard scholarly survey. Quintrell, Brian. Charles I 1625-1640 (Routledge, 2014). Roberts, Clayton and F. David Roberts. A History of England, Volume 1: Prehistory to 1714 (2nd ed. 2013), university textbook. Sharpe, Kevin. The personal rule of Charles I (Yale UP, 1992). Wilson, Charles. England's apprenticeship, 1603–1763 (1967), comprehensive economic and business history. Key, Newton, and Robert O. Bucholz, eds. Sources and debates in English history, 1485–1714 (2009). Kenyon, J.P. ed. The Stuart Constitution, 1603–1688: Documents and Commentary (1986). 1633—Hobbes in a Jonson masque?